Specially designed rod for mounting the Rhythm Watch to your kit in combination with the recommended.. Rhythm Watch holder TAMA. ..
TAMA's Rhythm Watch Mini "RW30"is a brand new, compact version of our renowned Rhythm ..
Rhytm watch metronome tama. .. 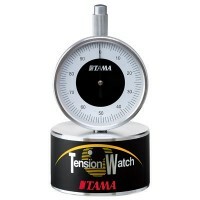 Tension watch drum tuner TAMA.The TW200 TAMA Tension Watch is very compact and is equipped with .. Rhythm Watch for drummers TAMA. The first timekeeper designed specifically for the band..